Synopsis: In a future land once known as Britain, nomad tribes are preparing to fight a terrifying enemy - the first-ever mobile city. Before London can launch itself, young engineer Fever Crumb must journey to the wastelands of the North. She seeks the ancient birthplace of the Scriven mutants. In the chaotic weeks before battle begins, Fever finds a mysterious black pyramid. The extraordinary secrets it contains will change her world forever. The seventh awe-inspiring adventure in the World of Mortal Engines series by a superb writer at the height of his powers. Fever Crumb is back with her father, the logical, scientific engineer, and her mother Wavey, the irrational but excitable Scrivener, but not for long. Within a few days she is back on the road, and this time she is with her mother, travelling to a black pyramid in the north which might hold the long lost knowledge of the Stalkers. While they are gone, London readies itself for departure. The city has been taken apart slowly in recent months and soon the new London, the traction London, will be ready to take its maiden journey across the land and become the first moving city. But not everyone is happy about this change. An uprising has begun that won’t stop until London is back to being a static city. The Fever Crumb prequel series always had a different air about it compared to Mortal Engines. It had a sort-of static, local feel to it- what with it being set in a pre-traction era London where London is still a sprawling city and airships are still a long way off from fruition. Scrivener’s Moon has changed that, and it is probably the novel closest to the original Mortal Engines series we’ve had from the prequel series so far. A Web of Air felt like a light frolick when read. 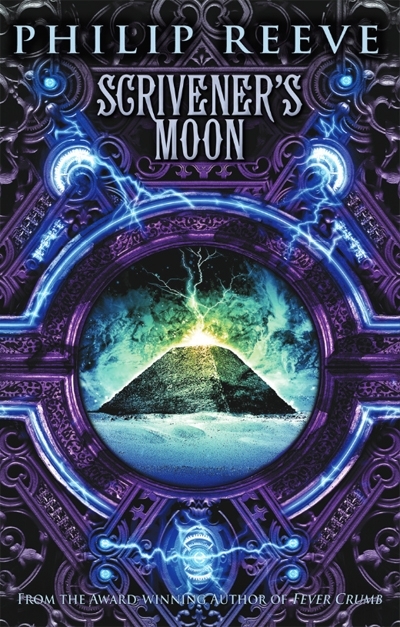 Scrivener’s Moon takes the series back to its darker, grander origins, back to the grimy cities that are beginning to traction-ise, back to the loud noises, smells and gargantuan scales of the great moving vehicles that can carry entire cities upon their backs. I’ve always been a fan of Philip Reeve’s novels, and more often than not I have very little to say that is negative. In this case, it’s simply that he uses Hamster’s Heath and Hamsterdam which, while I love how he evolves place names to emphasise the effect time has had on the world, the hamster prefix is a little cheesy and childish for my liking. Scrivener’s Moon introduces us to some great new characters, and amongst their mist are both Cluny and Charley (though he isn’t really new, he’s just a much larger part of the story). Cluny is an intelligent, good-willed daughter of one of the tribesmen from the north. She is both likeable and realistic. Charley is this novel’s antagonist: selfish and heartless, but always manages to get sympathy from the reader in that ‘digging for the loser’ kind of way (his childhood was much of a tragedy). For people who enjoyed the epic, large-scale settings of Mortal Engines, Scrivener’s Moon will be a step in the direction. I think it is safe to say that anyone who loved Mortal Engines has also loved Fever Crumb and uncovered more about the World of Mortal Engines. Scrivener’s Moon exposes some fantastic new details as well as introduces some (internal) character conflicts. It’s great to see Philip Reeve make this a character-driven series rather than a plot-driven one. Rather than letting the origin-story of the traction cities take precedence, Reeve lets the characters lead and he really manages to flesh them out while delivering some great story as well.